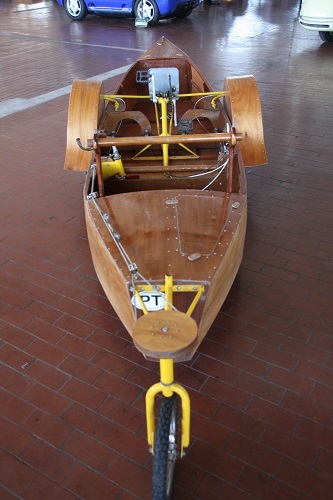 Inspired by watching events such as the Port Townsend (WA) Kinetic Sculpture Race, it occurred to local tinkerer and inventor John Montgomery how simple it would be to run a live axle through the middle of a canoe and use an inverted bicycle frame to drive it. The Autocanoe was born. The one seen here is the very first produced. Note the “001” carved into the forward rib. It does not have a differential and the brakes are caliper-style; the next production model (as well as the plans one may purchase online) switched to inboard disc brakes and included a differential. John claims that these two items made the Autocanoe much more maneuverable on land. 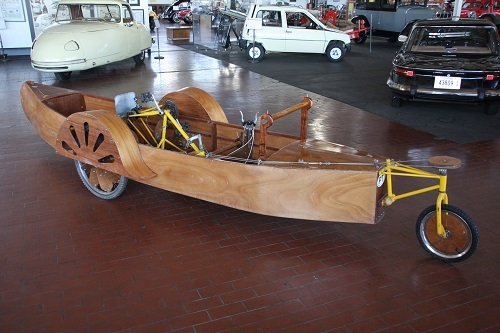 An excerpt from Autocanoe’s website: The Autocanoe is a pedal-powered, amphibious, recumbent tricycle and a roadable pedal canoe. 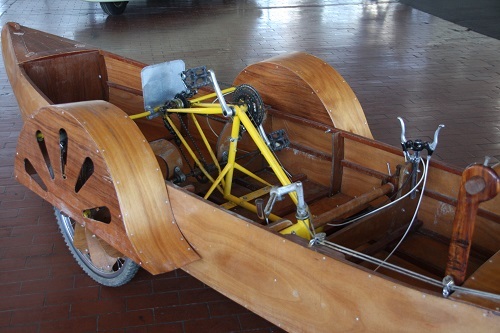 The configuration is that of a recumbent tricycle with the two forward wheels driving and the single rear wheel steering both on land and in the water. It can travel over the road and through the water with comfort and grace. Transitions from land to water and back are accomplished smoothly and seamlessly without leaving your seat. On the road it is stable and secure. On the water it is tractable and relaxing. 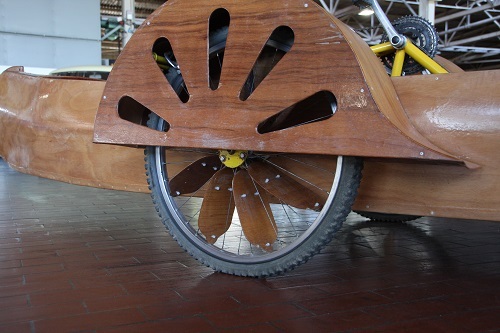 This human powered vehicle appeals to bicycle enthusiasts as well as wooden boat fans. Construction plans and a complete materials list are available online at www.autocanoe.com. Load capacity (displacement): 400 lbs.